Bruce Campbell is best known for the Evil Dead trilogy, for his campy acting style with a wink to the audience, and for his enormously square jaw. On TV, he starred in the whimsical Adventures of Brisco County, Jr with Billy Drago, and played an 18th-Century spy in Jack of All Trades with Verne Troyer. As a boy, Campbell loved Lost in Space and says just reading about Night of the Living Dead scared the crap out of him. His father was active in a local theater group, and young Campbell began appearing in local stage productions in his early teens, but he never studied drama beyond a few weeks of summer stock, where he was mostly "a behind-the-scenes gopher". His career path was set in junior high school, where he became friends with classmate Sam Raimi. The boys, both armed with 8mm movie cameras, made dozens of short and strange films together. Campbell attended Western Michigan University, but dropped out after a few months. 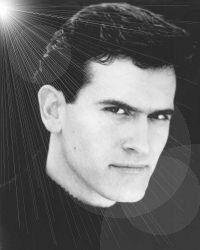 He spent more time hanging out with Raimi at Michigan State University, where together with Raimi's roommate Rob Tappert they formed Renaissance Pictures and, with a small loan from Raimi's father, Campbell starred in the Raimi-written Evil Dead. Featuring an ancient Egyptian Book of the Dead, tree monsters, cheap effects, gallons of gore, a hyperkinetic camera, and Campbell's overwrought performance, Evil Dead was far from a major hit, but the few people who saw it loved it. One of the movie's admirers was horror novelist Stephen King, who urged his Hollywood pal Dino De Laurentiis to fund a sequel, Evil Dead 2: Dead by Dawn. When zombie killer Campbell replaced his severed hand with a chainsaw, the horrific was hilarious, and the movie was a moderate moneymaker, especially with the advent of VCRs and later DVDs. With much more money to spend, the third Evil Dead film, Army of Darkness, was over the top with its zombies, monsters, demons, and jokes, but all three films are giants of the genre. In his other classic splatter and horror roles, Campbell played the policeman who might be a Maniac Cop with Tom Atkins, fought hostile aliens from the lunar surface in Moontrap with Walter Koenig, played a descendant of original vampire hunter Abe Van Helsing in Sundown: The Vampire in Retreat with David Carradine, and starred as the retired Elvis Presley in Bubba Ho-tep with Ossie Davis as John F. Kennedy. In perhaps his most serious dramatic performance, Campbell was very effective as an ex-con planning a heist in the little-seen low-budget Running Time. In more major league movies, he played the wisecracking reporter in The Hudsucker Proxy with Jennifer Jason Leigh, the Surgeon General of Beverly Hills in John Carpenter's Escape from L.A. with Kurt Russell, a movie star in The Majestic with Jim Carrey, and the P.E. teacher at a superhero school in Disney's Sky High with Michael Angarano. In the Coen Brothers' Fargo and Intolerable Cruelty, Campbell is briefly glimpsed in a soap opera on TV. He also had small roles in each of Raimi's blockbuster Spider-Man films, and voiced Fugax the adventurer insect in the cartoon The Ant Bully with Meryl Streep. On television, Campbell had a recurring role as Autolycus, the rather clumsy King of Thieves on Xena: Warrior Princess and Hercules: The Legendary Journeys. He did comedic turns on Charmed and Ellen, played a man seeking vigilante justice in a few episodes of Homicide: Life on the Streets, and he was an expectant father in a fetusnapping on The X-Files. More recently he has played Sam Axe, best friend of Jeffrey Donovan's character on Burn Notice. He met his wife, costume designer Ida Gearon, on the set of Mindwarp, wherein post-apocalyptic survivors live in an artificial reality until the outside world's mutants and cannibals kidnap the leading lady and stalwart Campbell comes to her rescue. He directed several episodes of Xena, Hercules, and VIP starring Pamela Anderson, and the Sci-Fi Channel's original masterpiece The Man With The Screaming Brain. Campbell and Gearon co-directed A Community Speaks, a dead serious documentary about land use issues. Campbell's autobiography is If Chins Could Kill: Confessions of a B Movie Actor. He is also the author of the novel Make Love the Bruce Campbell Way, in which a fictitious B-movie actor named Bruce Campbell lands a key role in a major motion picture starring Richard Gere and Ren�e Zellweger. "Everything in the book actually happened," writes Campbell on the cover blurb, "except for the stuff that didn't." Crimewave (19-Sep-1985) · Renaldo "The Heel"